Tortillas come in two versions: flour and corn. The roots of both formats began in the Spanish-speaking countries such as Mexico. Modern day Mexican foods still rely on tortillas as a base ingredient. For example, the classic burrito is a flour tortilla wrap with assorted fillings. The most effective way to save tortillas, whether they are corn or flour, is through proper storage. This will keep them soft and fresh until time to cook. Place the tortillas in a resealable plastic bag or airtight storage container. Keep them in the refrigerator for up to two weeks. Store the tortillas in the freezer if stocking up. Place them in a resealable plastic bag or air tight container prior to freezing. Move the tortillas to the refrigerator to thaw several days before using them. Heat the tortillas up in the microwave once thawing is complete. Place them in a microwave-safe container or on a plate then heat for 10 to 20 seconds. Cover the plate with a clean towel to keep the tortillas soft until ready to use. If your tortillas are store bought, use the original packaging as long as it has no tears or holes. If unopened, you can keep tortillas in the pantry or cupboard for up to two weeks. 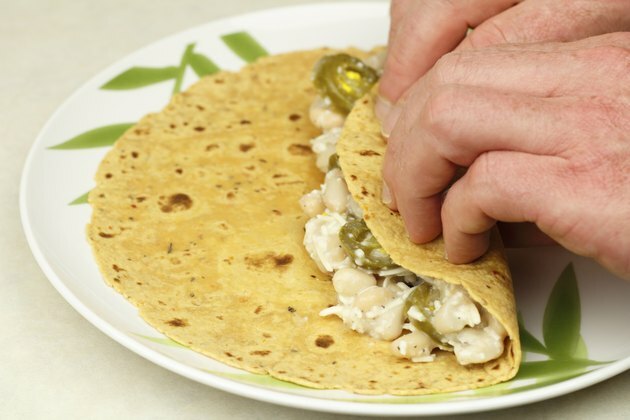 Try flavored tortillas such as spinach for sandwich wraps. Do not thaw tortillas in the microwave.